Did you know that it's possible for a book to win awards in both fiction and non-fiction? The Legacy Letters managed to do just that! 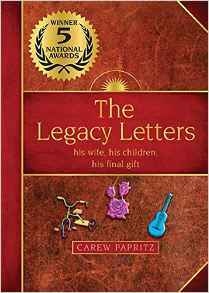 The premise of the book is that a woman receives letters written by her ex-husband after his death due to terminal illness. There's more to the story than that, and the circumstances surrounding the letters really pull at the heartstrings. However, it is a book of fiction, so that part is a cleverly constructed story to pull readers in. As a book of fiction, it still does a very good job of fleshing out the character of the letter writer, being believable and thought-provoking. What makes it possible to win awards as a non-fiction book is because it is also a work of inspiration, provoking a desire to understand life's questions and encouraging readers with letters that help them find their spiritual and moral compass. The whole point of the book is to help readers find what's really important, to hold on to that when all the craziness of our schedules gets in the way. The context in which it's written makes it a very enjoyable moral to read, and is written in such a way that everyone will find some nuggets of inspiration without being preached at.